I love the refreshing taste of dessert soups in the spring and summer. The juicy freshness of peaches are especially well-suited for this sort of treatment. 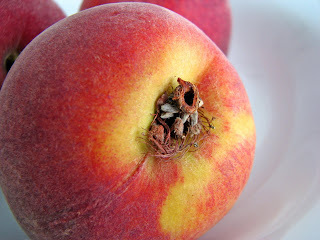 How many times have we stood over the kitchen sink as we bite into a super ripe peach? Here’s a way to enjoy the whole thing in a bowl. Add a scoop of aromatic Lemongrass Sorbet for an added note of citrus and you're set. 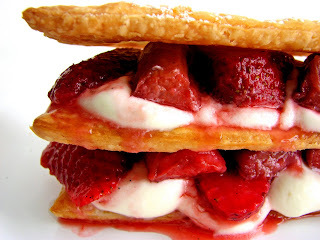 This would make a great ending to a grilled dinner or an elegant component of a champagne brunch. With very little effort, you can put this together and savor peaches in all their chilled luscious ripeness. Add a scoop of light lemongrass sorbet and you have an unusual and refreshing dessert - light, cool and crisp. 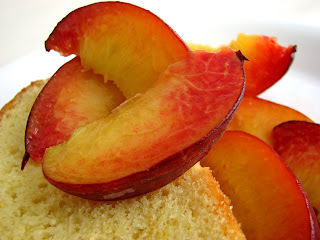 - The peaches need to be quite fragrant and ripe for optimum flavor. - If the skins do not peel off easily, blanch them in simmering water for just a few seconds and then place them in ice water. Pat them dry. The peel should slide off easily. - The amount of simple syrup and lemon juice you use for the Peach Soup will depend on the sweetness of your peaches. Keep tasting until you have the right balance. - The blueberries are a terrific addition, so do include them as a garnish. - For the Lemongrass Sorbet, I’ve added the vodka for a smoother texture and to keep it from becoming too icy. It does not affect the flavor. 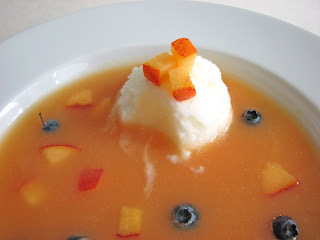 - You can make the sorbet a couple of days ahead. 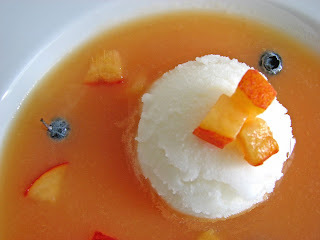 - Sorbet sometimes needs to churn a bit longer than a custard base ice cream in order to develop the right texture. 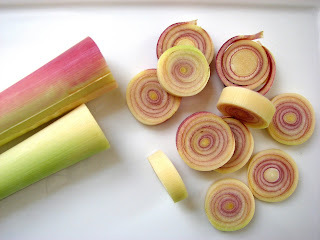 For the sorbet, slice the lemongrass into 1/4” pieces. Bring the water and sugar to a boil and add lemongrass. Take off the heat, cover and let steep for about an hour. Strain into a clean bowl. Whisk in the yogurt and lemon juice. Chill overnight. Add the vodka and churn in your ice cream maker until the mixture is uniformly smooth. Place in a clean airtight container and put in the freezer to firm up. To make simple syrup for the Peach Soup, combine 3/4 cup of water and 3/4 cup of sugar and boil until completely dissolved. Cool. Peel four of the peaches and chop them into medium pieces (reserve one peach for garnish). Place the chopped peaches in a food processor with the orange juice and puree. Add some of the simple syrup and blend. Taste and keep adding simple syrup until you have the desired sweetness. Do the same with the lemon juice until the mixture tastes bright and balanced. Put in an airtight container and chill. When ready to serve, dice the remaining peach into small bite-size pieces and set in a bowl with a spritz of lemon juice to avoid browning. Place a scoop of Lemongrass Sorbet in each of 4 flat soup bowls. 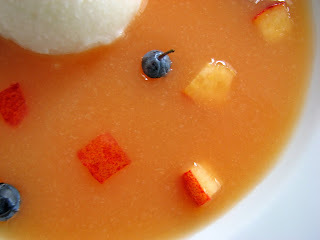 Pour the soup into the bowl and garnish with diced peaches and blueberries. Serve immediately. Fresh peaches have arrived! The first sighting for me turns out to be California peaches that are small and fragrant with a deep crimson blush. Beautiful. Since I always like to enjoy the season’s first tasting with minimal preparation, I served them sliced with skins on and bathed in a light honey lemon syrup, cozily nestled on a slice of Alice Medrich’s deliciously fragrant Olive Oil and Sherry Pound Cake. This is quintessential Mediterranean and northern California fare that seems a perfect way to ring in the new season of gorgeously plump and juicy fruit. Simple, flavorful and full of the colors you’d see in a Cezanne. 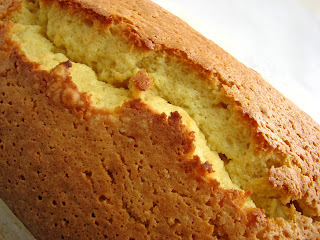 The cake has a dense tight crumb but is fairly light for a pound cake due to the substitution of olive oil for butter. The flavor is of course also considerably different thanks to the luscious scent of cold-pressed olives and the unique characteristics of amontillado sherry. The orange zest bridges the two and rounds out the different notes. Although wonderful all by it self, it’s especially fabulous with these fresh peaches. As the cake bakes, you’ll be surrounded with a dazzling aroma that will easily take you to the shores of Barcelona or the vineyards of Napa’s Silverado Trail. Dreamy. - Use an olive oil that is extra virgin and full of flavor. The sherry should be amontillado, which is in between a fino (darker) and an oloroso (lighter). It is often served with olives or cheese, nuts and dried fruit. It has a nutty, yeasty flavor with a hint of lemon. I used a dry Lustau Los Arcos. - The cake definitely improves when allowed to sit for a day. The flavors mingle and mellow together and are much more integrated. After it cools completely, wrap in an airtight container and give it some time. 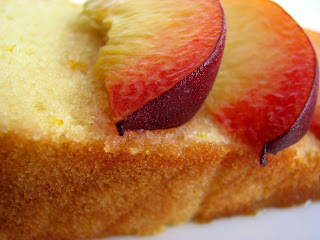 - This cake would also go well with apricots, nectarines, plums, pears or roasted dates or Noyau Ice Cream. Prepare two 8 1/2” x 4 1/2” loaf pans with oil and a wide strip of parchment paper, leaving an inch or two hanging over the longer sides of the pan. Whisk the sugar, oil and orange zest on high speed until well blended. Add the eggs one at a time, beating well after each addition. When all the eggs have been incorporated, beat until the mixture is thick and pale, about 3 to 5 minutes. Add one-third of the flour mixture. Mix on low speed just until blended. Add half of the sherry and mix just until blended. Repeat with another third of the flour, followed by the remaining sherry and then the remaining flour. Pour the batter into the prepared pans. Bake until a toothpick comes out clean with a few moist crumbs, 50 to 55 minutes. Cool for about 15 minutes. Gently lift the cakes up by the overhanging parchment paper and cool completely. Wrapped airtight, the cake stores well at room temperature for about 3 days. Place the honey and water in a saucepan and warm over low heat until dissolved and blended. Remove from heat and add the lemon juice to taste. Slice the peaches and toss with the honey lemon syrup. 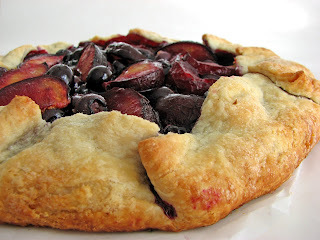 I spotted my first plum of the season and I’m totally thrilled to be back to making simple and delicious galettes filled with the fruit of the moment. I also had some blueberries on hand so decided to make a spring mix. 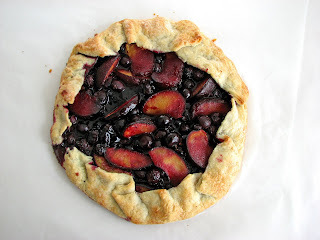 Galettes are simply the French version of a single crust pie without the need for a pie pan. When you want to savor nature at its finest without much embellishment, this is a quick and easy way to showcase the season's brightest flavors using your favorite fruit. 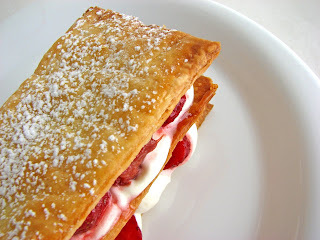 - Resist the temptation to add any more water to the pastry dough. Work it slowly and gently and it will come together. 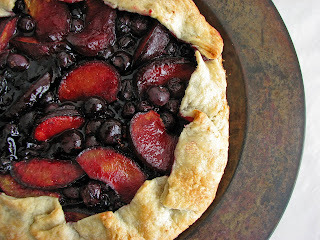 - The amount of flour and/or sugar to use for the filling will depend on your choice of fruit. 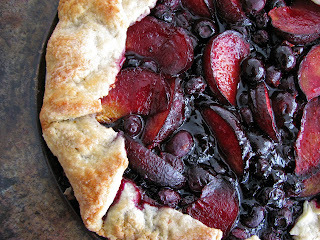 Plums tend to be quite tart and blueberries are quite juicy. To prepare galette dough, whisk the flour, sugar and salt in a bowl to combine. Cut the butter into the flour mixture until you have mostly small pieces the size of tiny peas and some just a bit larger. 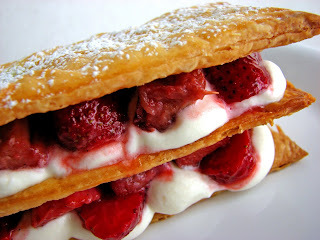 You can use your fingers to do this or a pastry blender works very well. Be sure each piece of butter is coated with flour. Add the cold water and mix gently with a fork or your fingers until the dough just starts to come together. Gather the dough on a work surface. Use a pastry scraper or metal spatula to get under the dough and fold it back onto itself. Gently pat down with your hands into a loose disc. Repeat this process again once or twice until the dough looks like it’s coming together. Place the dough on a piece of plastic and wrap tightly. Chill thoroughly, preferably overnight. When you are ready to roll out the dough, remove from the refrigerator and rest on a lightly floured piece of parchment paper for a few minutes so it can soften just a bit to prevent cracking. Then roll the dough out to a 14” circle about 1/8”thick, moving the dough after each roll and keeping the parchment lightly floured as needed. When you have the desired shape, lift the parchment onto a flat pizza pan or baking sheet. Chill for about a half hour. Squeeze juice of half a lemon into a large bowl along with the lemon zest. Slice the plum into thin wedges and toss in the lemon juice with the blueberries. Combine the sugar and the flour and set aside. Remove prepared galette dough from the refrigerator and sprinkle two tablespoons of the flour/sugar mixture evenly across the bottom, leaving about a 1 1/2” border all the way around. Arrange the fruit evenly on top. Sprinkle with the remaining flour/sugar. Now start to lift and gather the dough up and on top of the fruit, being very careful not to create any cracks that will cause the galette to leak. Work with both hands, pressing gently to keep the dough in place. Chill for one hour. Preheat the oven to 400 degrees. Brush the border of dough with melted butter and dust the dough with a generous sprinkle of plain or coarse sugar. Bake for about 40 – 50 minutes, until the dough is crisp and browned. Cool on a wire rack to keep the bottom of the galette crisp. Walnuts appear in just about every culture and invite an entire world of wonderful flavor combinations. 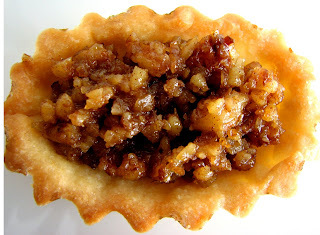 These tartlets are but one interesting and delicious blending of nuts and a mixture of the essence of coffee, spice and citrus. The crunchy, chewy nut filling contrasts nicely with the soft cream and crisp, crumbly tart shell. Luscious but not too rich, they make a very satisfying accompaniment to tea or coffee and look fun and inviting on any dessert tray. 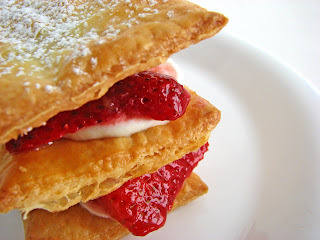 - The pastry dough can be made a day ahead and chilled. 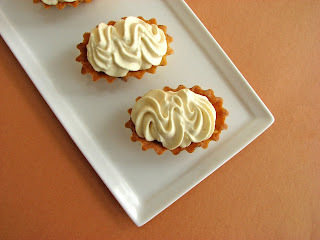 Once baked, the tartlet shells should be eaten the same day for maximum enjoyment. The filling can also be made ahead and stored in an airtight container in the refrigerator for several days. 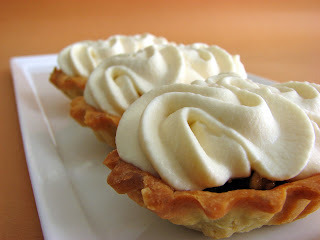 - I’d be tempted to try adding a very small dice of pear or apple to the filling for a little variation. Or a small dose of caramel to the whipped cream. Beat together butter and sugar until creamy. Add the salt, vanilla, and egg yolk and mix thoroughly. Add the flour and mix just until there are no dry patches. Wrap the dough in plastic wrap and press into a 4-inch disk. Chill several hours or overnight. Roll out the dough between two pieces of parchment paper. Dust one of the pieces of paper with flour, center the disk on it and dust the top of the dough with flour. Cover with the other piece of paper and roll out the disk into a 12" circle. If the dough starts to stick while you rolling, gently peel back the parchment and dust with flour. Flip the dough and parchment over and repeat on the other side, going back and forth until you have a 12" circle. Remove the top sheet of parchment and use it to flip the dough over. Peel off the other piece of parchment and cut the dough into several small pieces. Press evenly into small tartlet tins. Work quickly and pinch off any dough overhanging along the edges. Place on a baking sheet and chill thoroughly or put in the freezer for about 10 minutes or so before baking. Bake until slightly golden, about 13 minutes. Cool on a wire rack. For the filling, place the walnuts, sugar, cinnamon and orange zest in the bowl of a processor and pulse just a few times to chop the walnuts into smallish pieces. Don’t over process. You want small pieces but not paste. Pour into a bowl and add orange flower water. Stir to combine. Taste for flavor adjustments. Dissolve espresso powder in Kahlua. Whip cream, sugar and coffee mixture until soft peaks form. 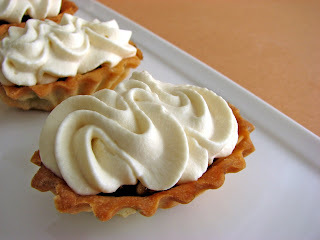 Fill each tartlet with walnut mixture and dollop or pipe the whipped cream on top.